India and France are expected to announce forward movement in the long-delayed SR-SAM 'Maitri' joint weapon programme this month when PM Narendra Modi is in France on his first official visit to the country as Prime Minister. The Defence Acquisition Council (DAC) cleared progress last month, stipulating that DRDO could take forward discussions towards a joint development of an SR-SAM system for the Indian Navy as a ship-borne weapon system. For the moment, the IAF's SAM requirements will be met by the Akash Mk.1, though MBDA is also looking for an in on the Akash Mk.2 programme with a technology plug-in from the SR-SAM. 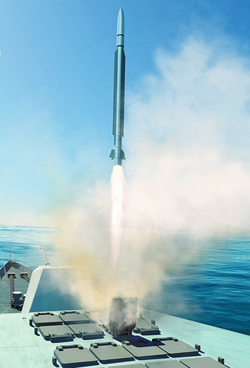 Top sources said that while the SR-SAM would now be developed keeping a vertical hot-launch from a universal deck cell configuration for Indian Navy warships, a land version could easily be spun off later should the requirement emerge. The Maitri sports a range of 15 km, a smokeless solid rocket motor and jet vane control for thrust vector type mobility in the air, especially during endgame flight. The missile will be developed to perform with the indigenously developed Revathi 3D central acquisition search and track radar. In many ways, development of the Maitri has already begun in earnest, with all workshare and development share modalities already worked out. The missile is believed to be intended as a hybrid of the in-service VL-MICA missile and technologies from the wound-up Trishul SAM programme.